Use our attorney-drafted Lease Agreement form to finalize the renting out of your house, apartment, condo, basement or attic. Create a binding contract between landlord and tenant. The Basics: What is a Lease Agreement? 2. The Basics: What is a Lease Agreement? A lease agreement is a written document that officially recognizes a legally binding relationship between two parties — a landlord and a tenant. This page covers residential agreements — click the following link if you’re looking for information about commercial lease agreements. A landlord and a tenant shake hands after successfully negotiating an agreement. An example of an agreement that contains all of the necessary basic information. Click here to see a full list of critical details that should be included in a simple lease agreement. The sample residential lease agreement below describes a contract between “Landlord” Keith Richards and “Tenant” Clara Trueba. She agrees to rent a two bed room, two bathroom apartment in Los Angeles for $2,000 per month for a fixed length of 12 months. The tenant agrees to pay for electricity, gas, water, cable television, and telephone, and the landlord agrees to pay for trash and sewage. This is a good example of what provisions a simple lease agreement might contain, and how one should look in its final form. If you’re looking for an alternative to leasing out your place, there is also the option of being a host on Airbnb for guests instead. However, take a look at our guide before considering such option. 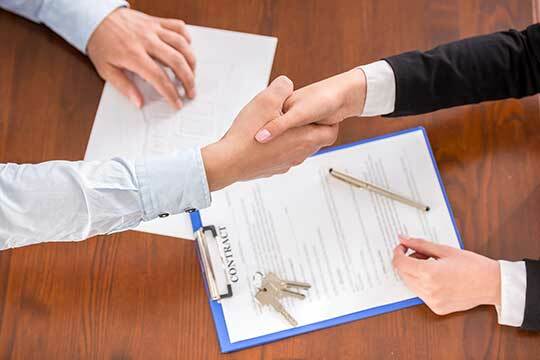 Why do you need a residential lease agreement? When a formal relationship exists between two parties, the law recognizes that both the Landlord and Tenant have a special set of rights and obligations. This document has the added advantage of laying out possible problems that might occur and then detailing possible solutions available to the Landlord and Tenant. In contrast, an oral agreement (verbal, spoken, or word of mouth) is difficult to enforce in a court and is unlikely to accurately capture important details over time. Memories fade, people remember different things, and sometimes we understandably change our minds because circumstances change. You may be on the fence about renting or selling your apartment or home. Read our article to help you make an informed decision: Should you Rent Or Sell Your Home? A written version, however, serves as a constant reminder to everyone, including you and the court, about what everyone agreed to at the beginning of the relationship. In contrast to a verbal, spoken, or oral agreement, an agreement in writing clearly spells out the detailed promises between the Landlord and Tenant and also explains what should happen if they break their promises to each other. If you’re planning on running a landlord business professionally, keep in mind that these promises carry the full weight of the law — avoid making these 7 major mistakes that could spell the end your business. What happens if you do not have this document? The consequences can be severe. This document can resolve problems in a neutral and objective manner before a simple problem becomes a more complicated problem. Who needs a lease agreement? A landlord and a tenant no longer have to be a person. In fact, a landlord or tenant could actually be an organization or company that owns an entire apartment building or just two normal people. 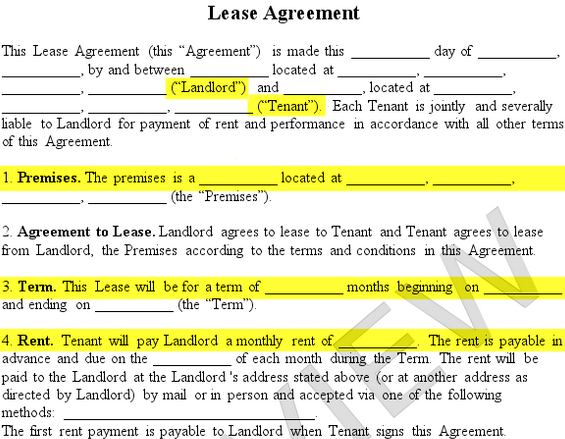 An example of where to write Tenant and Landlord names. It is common sense for a Texas residential lease agreement to explicitly identify that everyone is talking about the same place — a sleek and modern studio apartment in Dallas or the attic room of a rustic home of a college town like Austin. Our version requires you write down the exact address and type of place being rented (the “Premises”). A standard document should detail exactly when the lease begins and ends. By listing the date, there is a clear understanding of when the relationship and the promises start and finish. If you plan on renting for more than 1 year, the lease agreement MUST be in writing in order to comply with the Statute of Frauds. Note: If the Tenant does not renew the Lease and the Landlord allows the Tenant to continue staying on the Premises after the Lease expires, states usually treat this as a month-to-month- tenancy. “Just pay what you think is fair,” or a number written on the back of a napkin is not an option. This document should explicitly list the monthly rental amount. If you are unsure of what the going rate is for a place, check out Zillow. You can also include the terms of whether the rent may be subjected to changes in future, using a Notice of Rent Increase. Other details may include what happens if rent is late. Will a late payment fee or interest rate apply? For example, if the monthly rent of $500 is due on the first of the month, what happens if the rent is not paid until the 15th of the month? You can use a Late Rent Notice to ensure rent payment is made. Learn more about late rent fees from Nolo. An example of the “Rent” and “Additional Rent” sections. 5. What about a Security Deposit? Landlords have the right to collect a Security Deposit from their Tenants. Security Deposits are usually paid up front at the beginning of the lease. The Tenant promises that they will treat the Landlord’s home like their own. The Landlord promises that they will return the Security Deposit if the Tenant does not damage the Premises. For more information about Security Deposits, please read this Wikipedia article. An example of the “Security Deposit” section. Each state regulates the maximum amount a Landlord can collect from a Tenant as a security deposit. We recommend you check the requirements of your state, but here is a useful chart compiled by Nolo outlining the limits of a security deposit. 6. What other details should be included? Access: may the Landlord come over to use the laundry machine? Alterations: can the Tenant paint the bedroom, hang a chandelier in the living room, or install a security alarm system? Guests: can the Tenant have a short term guest stay for two weeks? Keys: how many copies of the key can be distributed? Pets: can the Tenant have a pet hamster if they ask the Landlord? Right to Entry: can the Landlord come and make repairs or show the home to a possible future Tenant? Maybe only after giving the Tenant 24 hours advance notice, unless there is an emergency water pipe burst? Smoking Policy: can the Tenant smoke inside the Premises? Sublet: will the Tenant be allowed to sublet the apartment to someone else without the Landlord’s permission beforehand? Note: Subletting period must be for less than the lease term. Water Beds: can the Tenant have a waterbed or “liquid filled furnishing” that uses 10 or more gallons of liquid? *Other: can the Tenant start a small raised bed garden in the backyard? Attorney Fees: who should pay the lawyer fees if there is a disagreement? Guarantor / Co-Signer: does the Landlord require the Tenant have someone pay rent if the Tenant is unable to do so? Late Rent Fee: should the Tenant be responsible for paying a late fee in the event of missing a rent payment? Utilities: who should pay for the light, gas, heat, and water? Appliances: will the Landlord provide a refrigerator or dishwasher? Furniture: will the Tenant need to use the Landlord’s existing furniture? Option to Purchase: can the Tenant buy the house at a later time? Parking: where can the Tenant park their bicycle, Segway, car, or RV? Asbestos Disclosure: if the apartment was built before 1981, did the Landlord tell the Tenant not to hang pictures on the walls because asbestos exposure increases if the walls and ceilings crumble? Fire and Accidents: can the Tenant leave the Premises and end the Lease if a fire, flood, or earthquake destroys the Premises? Lead Disclosure: if the house was built before 1978, did the Tenant receive a Lead Based Paint Disclosure Form or EPA Pamphlet? Noise Policy: are there any quiet hours in the apartment building, condominium, or neighborhood? Notice: when must the Landlord tell the Tenant to leave? Property Maintenance: who is supposed to cut the grass, take out the garbage, or unclog the kitchen and bathroom drains? Renewal: is there an option for the the Tenant to renew the Lease? Rent Increase: how much advanced notice must the Landlord give? 7. When are you finally done? Once you have finished negotiating and discussing the details . . . Step 1: Print – print TWO copies for you and the other party. Step 3: Save – File a hard printed copy of the SIGNED document in a safe place AND scan a soft electronic copy in secure cloud storage like Google Drive or Dropbox. Alternatively, let Legal Templates take care of this for you. Step 1: Print or PDF – generate a PDF of the document using our easy form builder that you can print or email to the other party for review as you hash out the details. Step 2: E-Sign & Share – digitally sign your name and allow the other party to sign electronically. E-signatures are validly recognized in most states. Step 3: Save & Store – we save a digital copy of your signed agreement and store a copy for both parties on our secure server. Even after it has been signed, remember to do a walk through of the Premises together. Before the Tenant moves into the Premises, use a helpful checklist like the one provided by the University of Santa Cruz (UCSC) to document the current condition of the Premises. A month-to-month lease means the agreement is for a one month period with no predetermined end date and continues month-to-month until either the landlord or tenant terminates the agreement. A fixed term lease means the agreement is set for a predetermined and fixed period of time and expires at the end of the agreement. The length of time may be 6 months, 1 year, 2 years, etc. A lease agreement of 1 year or more MUST be in writing in order to comply with the Statute of Frauds in most states. Should the lease start date (effective date) be the same as the move-in date? The lease start date does not have to be the same as the move-in date. The lease start date is when your tenancy starts and should be a date prior to the move-in date. Once the tenant has finalized and signed the lease agreement with the landlord, then they can move in at anytime starting from the effective date of the lease. In the event the Tenant defaults by any reason other than failing to pay rent (i.e. having a pet if not permitted or breaking any other rule specified in the Agreement), the Landlord may give written notice to the Tenant to terminate the agreement. Specify the number of days’ written notice the Landlord will give to the Tenant before terminating the agreement. The notice period can vary by state so we recommend you check your local laws. Rules regarding failure to pay rent and violation of lease rules are regulated by state and local law. It is strongly recommended that you check the most up to date laws in your state to make sure these provisions meet those requirements. Arbitration is when an arbitrator, a neutral third party selected by the parties, evaluates the dispute and determines a settlement. The decision is final and binding. Mediation is when a mediator, a neutral third party selected by the parties, tries to facilitate a compromise and agreement. The decision is nonbinding. It is the landlord’s discretion how much to charge for rent, but usually it is comparable to other properties within the same area. Zillow provides general guidelines on how much to charge for rent. The monthly rent amount is usually based on the home’s real estate value and can range between 0.8 to 1.1 percent of a home’s value. Other factors that may affect the rental price include the neighborhood and the condition of the property. If you are not sure, it is best to check comparable properties in the area. Rent control laws may limit the amount that you are able to charge for rent. To ensure that you have the latest regulations on rent control, it is recommended to check your local rent control ordinance by looking up the local rent control board. The rent due date is the date when the tenant has to hand over the rent due for that month. Rent is usually due on the 1st of the month, but feel free to change it to to another day. There are many ways to have rent paid. Write more here about provide a mailing address for paper check to be mailed / providing info for party’s payment. When should I charge prorated rent? The Landlord may choose to charge prorated rent for a portion of the first month if the lease begins on a day other than the day the rent is due. For instance, the Tenant moves in on March 18 but the Landlord wants the rent to be due on the 1st of the month. The Landlord would charge prorated rent for March 18th to March 31st and the regular monthly rent is due thereafter on April 1, May 1 and so on. What is the grace period for late rent payments? The grace period is a short period (typically 3-5 days) after the rent due date. During this time, the tenant can still pay the rent without being charged a late fee. As long as the tenant pays the rent before the end of the grace period, then a late fee will not be charged. Some states regulate the length of the grace period. In other words, the landlord must not charge a late fee for late rent for a certain number of days. Please check your state and local law to make sure your grace period is within the correct time period. Follow these guidelines if you aren’t sure what to do when the rent is late. What is a guarantor (or cosigner)? A guarantor on a lease agreement agrees to pay the rent and other charges on behalf of the Tenant if the Tenant is unable to do so. The guarantor will jointly sign the lease agreement with the tenant. The guarantor is commonly one of the Tenant’s parents, guardians or family relatives. The guarantor is also referred to as a co-signer. Should I require the tenant to have a guarantor? Usually if the tenant does not have a lot of credit history or is particularly young (such as a college student), then the landlord will require a cosigner or guarantor. Requiring a cosigner for the tenant is mainly for the landlord’s protection in case the tenant defaults on the lease. In case the tenant defaults and cannot pay rent, the cosigner is responsible for paying the amount due to the landlord. The guarantor is usually someone in good financial standing or has excellent credit. Feel free to use a Lease Application in order to require any prospective tenants to undergo a credit check before allowing them to sign a lease agreement. In the event the Tenant defaults by failing to pay rent, the Landlord may give written notice to the Tenant to terminate the agreement. The Landlord must give the Tenant adequate warning in writing a certain number of days number of days before terminating the agreement. The notice period can vary by state so we recommend you check your local laws. Read these guidelines if you aren’t sure what to do when a Tenant is late paying the rent. When can the landlord use the security deposit? The landlord may use the security deposit in certain circumstances specified in the lease agreement, such as in the event the premises are found to be damaged under the tenant’s care. Landlords commonly charge an amount equal to one month of rent, subject to state laws. When does the landlord return the security deposit to the tenant? After the tenant’s lease ends, the landlord is to return the security deposit to the tenant within a certain number of days. Check the relevant laws in your state for the correct time frame after the termination of the agreement for the landlord to give back the deposit. Security deposit rules are regulated by state and local law. It is strongly recommended that you check the relevant laws in your state to make sure these security deposit provisions meet those requirements. For example, some states require interest to be paid on the security deposit. Who should be responsible for which utilities? Normally, the tenant pays for all utilities but in some cases the landlord will pay for trash and sometimes water. However, you can specify which utilities (electricity, gas, telephone, television, water, trash, sewage, or any custom expense you wish to enter) are to be paid by the tenant, and which ones are paid by the landlord. Generally speaking, if the property has an individual meter to track gas, water, and electricity usage for the tenant, then the tenant will pay for his or her own utilities usage. If there is no meter and utilities are shared, the landlord should disclose this in the lease agreement. Where can I find more information on utilities? What happens if my property was built prior to 1978? If the housing was built prior to 1978, the lease/rental agreement will contain a disclosure page on lead-based paint and/or lead-based paint hazards. There is a federally approved disclosure form (“Disclosure of Information on Lead-Based Paint and/or Lead Based Paint Hazards”) and information pamphlet (“Protect Your Family From Lead In Your Home”) that you can download. What additional information about the property should I include? If your property requires an additional description or provisions on what is included or excluded from the lease, then it is best to include it along with any restrictions regarding its use. For instance, you may want to note that the apartment includes the use of the roof, a swimming pool, or some other shared common area in the building. If you live in a condominium or subdivision, are there neighborhood quiet hours or guidelines the Tenant should be aware of in the Lease? For example, your Homeowner’s Association (HOA) may require the tenant to maintain the property such as the lawn being mowed regularly to avoid being an eyesore in the neighborhood. What additional provisions should I include? Some states have mandatory disclosures such as disclosures regarding the presence of asbestos or mold. You should check your state law and include disclosures about the leased property. Should I include a disclosure about asbestos or mold? Asbestos was a common insulation material for houses built prior to 1975 and is a hazard if you plan on doing remodeling or reconstruction of your house. Please check your state and local law to make sure you include any mandatory disclosures on the presence of asbestos or mold. If you’re unsure of the maintenance and liability regarding mold in the rental property, be sure to detail it in the lease agreement and enforce the responsibilities of property cleanliness. 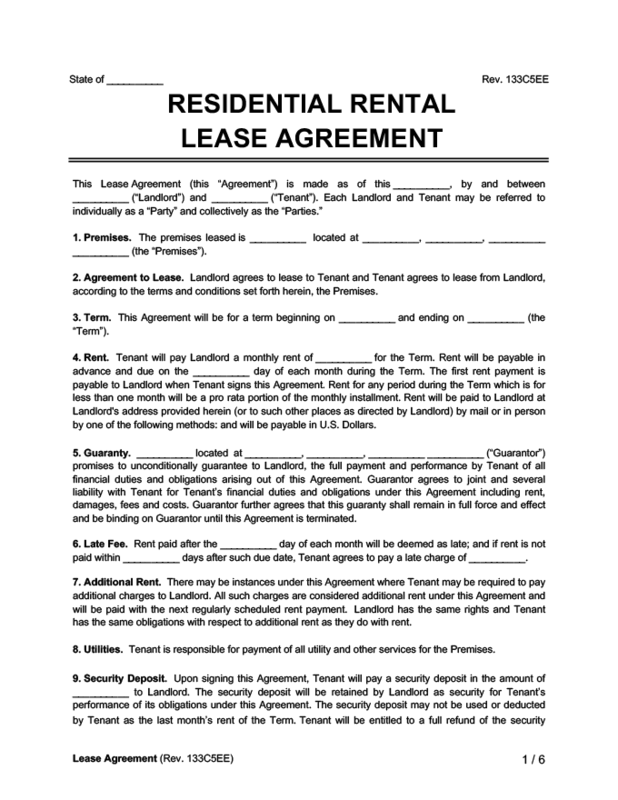 Can I include more than one tenant on the lease agreement? Yes, if the tenants are living on the same Premises during the same time period and subject to the same terms of the Lease. Joint and several liability means that all the Tenants are responsible both individually and/or collectively for any property damage caused during the Lease. What should be included in the pet policy? The pet policy should clearly outline the type of pets that are allowed (if any), how many of each type, and the expected care and cleanliness to be maintained if a tenant will keep a pet on the premises. You can also specify any rules regarding the pet and whether you have the right to change the pet agreement as long as you give proper notice (at least 30 days). What should be included in the visitor policy? The visitor policy should specify if guests are allowed and under what conditions. For example, you may include the maximum length of time a guest can stay, whether or not giving notice to roommates is required, or any rules and regulations that the visitor must follow during their stay. By default this Agreement includes the landlord’s right to enter the property at reasonable times to inspect the property, make improvements or repairs, as well as enter in times of emergency. As the landlord, it is a good idea to give reasonable notice to your tenant before entering the property. For example, in the event of a pipe leaking, you can enter the property but it is wise to give notice to the tenant. Right of entry rules are regulated by state and local law. It is strongly recommended that you check the most up to date laws in your state to make sure these right of entry provisions meet those requirements.